**Please Note. No helium balloons are allowed in the hotel due to our atrium/sprinkler systems. 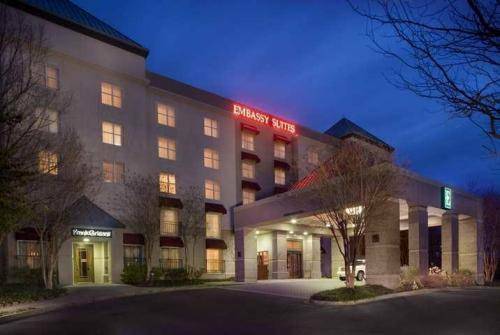 THIS HOTEL IS 100PCT NON SMOKING The Embassy Suites Memphis hotel is adjacent to the Regalia Shopping Center and is conveniently located in the East Memphis business sector near the I-240 and Poplar Avenue exchange. This full-service upscale all-suite Memphis hotel is just minutes from FedEx World Headquarters International Paper ServiceMaster Regions Bank TPC at Southwind Memphis International Airport University of Memphis Mike Rose Soccer Complex. Also close by this hotel in Memphis are the communities of Germantown TN Cordova TN Barlett TN Colliereville TN Downtown Memphis. Nearby Memphis Attractions include FedEx Forum home of the Memphis Grizzlies AutoZone Park home of the Memphis Redbirds Beale Street National Civil Rights Museum Elvis Presley*s Graceland Memphis Zoo Memphis Botanical Garden Germantown Performing Arts Center Stax Museum of American Soul Gibson Guitar Factory Theatre Memphis Brooks Museum of Art Memphis Pyramid Tunica Casinos. Guests of the Embassy Suites Memphis hotel stay in spacious two room suites and receive Complimentary cooked-to-order breakfast. In addition this beautiful Memphis hotel provides an evening reception. Complimentary High Speed Internet access is available throughout the hotel. Complimentary transportation is provided to and from the Memphis International Airport and within a five-mile radius of the hotel. Through August 2015 our lobby select guest suites atrium pool and fitness center will be undergoing renovations. We will be offering a limited selection of breakfast items beverages and snacks during this time. Our restaurant Frank Grisanti*s is still open for lunch and dinner. We appreciate your patience as we improve our hotel. View our hotel specials at your leisure. all reservations must be guaranteed to major credit card regardless of time of arrival. all reservations must be cancelled 24 hours prior to arrival unless deposit required. Upscale Italian food Specializing in fine Northern Italian Cuisine Frank Grisanti*s offers classic pastas hand cut Prime Black Angus Beef Pizza Fresh Sea Food fine wines and much more. Memphis*s best wet barbeque. Great home made bread. Upscale Italian Bistro food. Great grilled salmon.